Grilled chicken breasts are made extra-special with a flavorful goat cheese sauce. The sauce is seasoned with parsley and garlic herb seasoning. Feel free to broil or pan-grill the chicken in this recipe. The roasted red pepper makes a beautiful base for this dish, but it can be omitted. Put each chicken breast half between two sheets of plastic wrap; pound lightly to flatten evenly. Salt and pepper both sides of the chicken pieces. 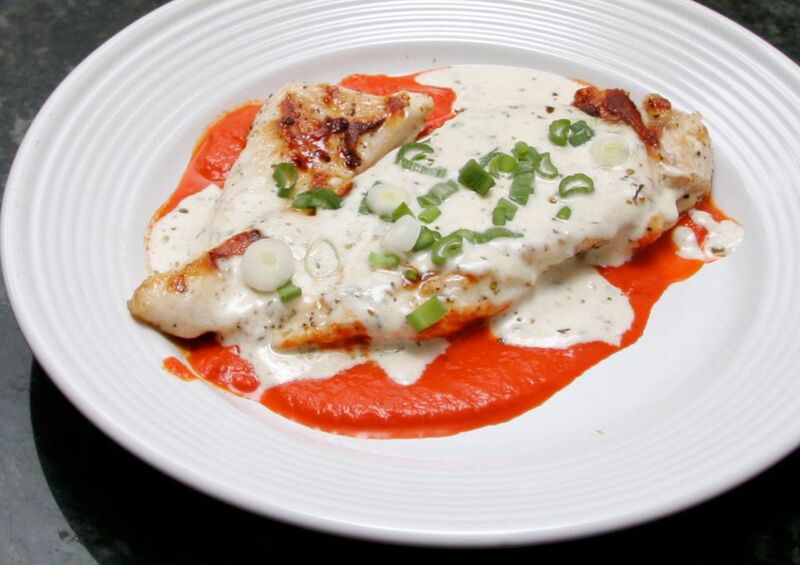 If desired, place a few spoonfuls of the red pepper puree (below) on the plate, place the chicken breast on top of the sauce, and spoon the herbed goat cheese sauce (below) over the chicken. *The minimum safe temperature for chicken is 165° F (74° C). Combine 1 tablespoon of olive oil, wine, and chicken broth in a saucepan; bring to a boil. Continue cooking over medium heat until reduced by about half. Add the parsley, goat cheese, salt and pepper, and garlic herb seasoning, if using. Continue simmering, stirring frequently, until the sauce is thickened. Combine the roasted red peppers, garlic, hot sauce in a blender or food processor. Process until smooth. Force it through a mesh sieve, if desired. Taste and season, as needed, with salt and freshly ground black pepper.